If you like the idea of looking for Spring flowers, but would rather the help of a guide, why not join BBOWT on 13th April 2019 2-4.30pm for a walk to discover a variety of plants including spring flowers near Dancer’s End? A lovely way to discover the natural world around us! Or wrap up warm and bring the family along for some “sticktastic” adventures at College Lake, Tring (11th April)! Easter Explorers can solve the clues and win a prize at Warburg Nature Reserve, Bix Bottom (11th April). If you’d rather discover the wildlife of the River Thames, inspiration for “The Wind in the Willows” the Chilterns Conservation Board and Hobbs of Henley invite you on Tuesday 16th April to their “Wildlife on the Move” event to enjoy the flora and fauna of the River Thames from the luxury of a pleasure craft. Expert volunteer guides will help you to identify the wildlife and other hidden treasures on a 75-minute trip between Henley and Hambleden. Nestled in the centre of the stunning village of Ewelme, the Ewelme Watercress Beds and Local Nature Reserve offers the opportunity to discover some unique aquatic habitats, rare British wildlife and other plants species including watercress! So why not go to their April open day and guided talk on 7th April? Discover animals made of bricks! From the 6th April 2019, if you are crazy about animals and wild about Lego, you can combine the two at ZSL Whipsnade Zoo's Great Brick Safari! Discover LEGO brick beasts and mammoth LEGO brick mammals as well as all the “real” animals at the zoo. A unique and memorable experience for the whole family to enjoy! Become a Junior Ranger for the day (9th April, 5-12 year olds) with the Chiltern Society Get the kids outdoors and immersed in nature at the Junior Ranger events at Whiteleaf Hill Nature Reserve. Join Chiltern Society staff and volunteers for a morning of outdoor activities designed to encourage and inspire your young nature explorers. For something a bit different why not join the Chiltern Rangers' Green Thursdays for a litter pick as part of the Great British Spring Clean. On 9th and 16th April 2019, children can take part in special activities on Terrific Tuesdays at the Chiltern Open Air Museum , from a Spring scavenger hunt and woodland minibeast quiz to joining a traditional village fete game. More information here. Wendover Woods - The Forestry Commission is partnering with Premier to present some exciting children's adventure activities this Easter Holiday. There will be Den Building, Geocaching, Trail Running, Archery and Fencing and some Multi Activities combining all of the above for ages 3-5. Bucks Goat Centre, Stoke Mandeville - As well as the usual mix of goats (including some new babies), alpacas and other farm animals the Bucks Goat Centre has a packed activity programme for Easter, including free balloon days, Easter crafts, Bunny Brunch, Ferret Fun, Alpaca Friday, Easter Egg hunts and a Birds of Prey Day. BBOWT volunteers will be on site on 17th-21st April as well. Hughenden Manor, Bucks – Easter Egg Trail, Junior Ranger – Trail Tracker and The Great Big Tree Climb. Nuffield Place, Oxfordshire – Spring Bulbs, Accessible Bluebells and Easter Weekend Celebrations. Grey’s Court, Oxfordshire – Cadbury’s Easter Egg Hunt, Chocolate Tasting, Bluebells and Wistaria. Waddesdon Manor, Bucks – Photography School – capturing Spring, Spring Trails, Water Garden Walk, Meet the Aviary Keeper, Artisan Food Market, Cadbury’s Easter Egg Hunt, National Youth Girls’ Choir pop up. Ashridge Estate, Herts – Easter Crafts, Exhibition: Nature Detectives, Gentle stroll – signs of spring, Cadbury’s Easter Egg Hunt – Early Bird, Cadbury’s Easter Egg Hunt – Easter Weekend. Dunstable Downs and the Whipsnade Estate – Bug Crowns Craft Workshop, Ladybird House Workshop, Easter Obstacle Race, Apple Bird Feeder Craft, Cadbury’s Easter Egg Hunt. If vintage trains are your thing then there’s plenty on offer at the Chinnor and Princes Risborough Railway which is running a vintage steam festival over Easter. Even better, kids go for £1 with a full price adult. The Bucks Railway Centre in Quainton also has a free Easter Egg Hunt on its "Steaming Days" over Easter - 7th, 10th, 14th and 17th April. why not go to a cinema with a difference? The Vintage Cinema at the Hell-Fire Caves in Wycombe or the Natural History Museum in Tring is guaranteed to give you a night to remember. And if you are not a night owl, try the Hell-Fire Caves followed by a walk around West Wycombe and a visit to the traditional sweet shop for a special treat! Or for younger families, the Natural History Museum at Tring has a new exhibition on British Dinosaurs. Explore the surprising diversity of British dinosaur species and find out about the dinosaurs that still live among us in our gardens and parks. Why not go on a spring nature treasure hunt in your area? Grab your wellies, look at this handy guide and get exploring. 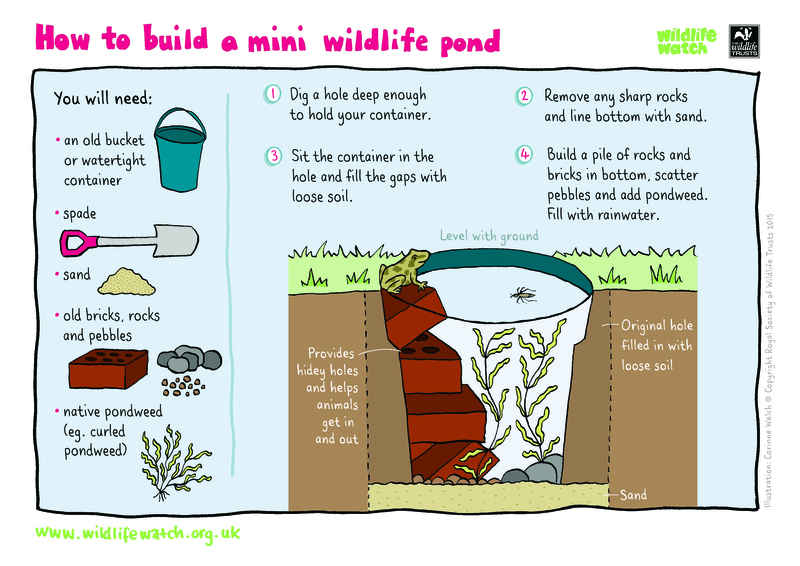 You could also be more adventurous and build a mini wildlife pond in your own garden! Guaranteed to attract all sorts of insects and animals, it will be a great educational project. Or head out on one of our self-guided walks. There is a range to choose from that can be found on our interactive map – use the filters to narrow down the options to suit you! Options include the Berkhamsted Waterways Walk, the Fryers Farm circular walk from Lane End and four stile free walks around Whitchurch Hill plus many more. With something for every interest, budget and age group, there will be no room for "Mum, I'm bored!" this Easter holiday in the Chilterns.